When you think of content optimization, what’s the first thing that comes to mind? Do you think of keywords, links and search engines? Or do you focus on useful content, interesting articles, engaged audiences and happy customers? If you’re in the second camp, you’re clearly familiar with “the big picture” of optimization. But if you’re in the first camp, then stick around—sounds like you need a new perspective! The most important thing we learned from the Google Panda updates in 2011 is that search engines are really serious about improving search quality and user experience. Since then, the priority for site owners has been to create original, interesting and sharable content that attracts links from other sites. 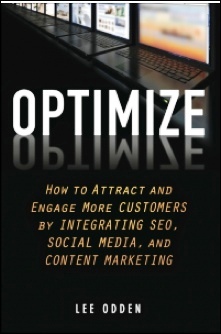 Lee Odden has written his first book titled, Optimize: How to Engage More Customers by Integrating SEO, Social Media and Content Marketing. In the book, he takes a holistic approach to content and search optimization and proposes that companies should consider all of the digital assets, data and content they have to work with in order to make both customers and search engines happy. Here’s what you need to know about the book. Lee Odden would like to change the conversation about what optimization means and help companies realize that a customer-centric approach to content that engages and inspires action is more profitable than fussing over keywords and links. His objective is that marketers, PR professionals, small- to medium-sized business owners and large company marketing executives will think more about how to meet their target audiences’ needs with content they truly care about. At 223 pages, the book is divided into three Phases. In Phase 1, you will learn about the changing nature of consumer preferences and behaviors in terms of search, social media and content, and what that means for your online marketing strategy. In Phase 2, you will learn some “optimized content marketing tactics,” such as content planning, measurement and developing buyer personas into topics. Phase 3 is all about scaling. You will be introduced to the processes and training needed to grow and maintain an integrated social media, SEO and content marketing program in your organization. No doubt you’ve had this experience: You’re searching on Google or Bing, and you come across a page that is clearly “optimized” for SEO. This page has a high rank in SERP but when you click through, the actual content doesn’t do much for your overall experience. Use words that matter most to your customers in titles, links and body copy in order to inspire your readers to take action. Text used in titles should make it easy for readers to understand the topic of the page in the first few words. Text used to link from one page to another should give readers a good idea what they’ll find on the destination page. A consistent approach to titling, labeling and copy in your web pages, image captions, video descriptions and links will create more confidence for the reader and inspire sales. These tips will help you to create an experience that is more relevant to your customers and at the same time produce content that is search engine–friendly. But if you focus only on keywords, links and search engines, you stand the chance of alienating your customers with content that lacks creativity and inspiration. 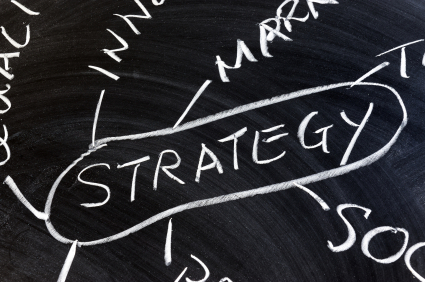 A winning strategy requires setting marketing objectives that align with overall organizational goals. Image source: iStockPhoto. This is the general objective for all companies across the board. But when it comes to practical online marketing objectives, these will be unique to each company’s situation. Some companies want to increase their number of customers, others want to focus more on revenue and profitability, and still others want to emphasize customer retention. These are all great objectives and from a search, social media and content perspective, being able to tie them to overall organizational goals is essential. In a nutshell, the simplest thing to do is evaluate your online marketing strategy for what has worked so far and what needs improvement. To tie marketing goals to overall business goals, think about how well your site is performing currently and what the overall online business goals are for the future. It’s a good idea to mix curated content with original content. In fact, content curating is a great way to extend your own site, but only in addition to—not instead of—your original content. Rule of thumb: Pure creation is demanding. Pure automation doesn’t engage. Curating provides the best of both worlds. Here are some content curation tips. Unfortunately the answer is a long time. Here’s why. The time to start building a social network is not when you need it. The time to start is well beforehand, because it takes time to develop relationships. It takes time to listen, participate, create optimized content and understand the triggers that will inspire sales or referrals. It takes a long time to develop online relationships that lead to social media ROI. Image source: iStockPhoto. Many small businesses go after the most popular social sites with a “fish where the fish are” mentality. While that is not an unreasonable strategy in itself, it’s important to know which specific social networks are relevant to your customers. Because there are only a handful of social networks, chances are one or more will be relevant for your online marketing and there are many opportunities for brands on each network. Here are some of them. Google+ hangouts for B2B brands can be used for videoconferencing to answer questions, conduct training or offer creative pitches. Google+ allows you to upload a mix of updates, images and videos to relevant segments of your network. Because Google+ is integrated with Google search, the more people who add your brand to their circles, the greater the chance that you will appear in those users’ Google search results. This book scores very high on two points in particular. First is the author’s interpretation and delivery of a very complete and holistic Internet marketing strategy that includes search, social media and content marketing. This is not a new approach, but Lee Odden delivers excellent insight, detail and practical application on the subject. Second, I love the way he offers a fresh perspective on the conversation surrounding optimization, as well as his candid critique of the misguided approach to SEO that a lot of marketers have taken. On the downside however, I’ve already come across several books that are very similar to Optimize. Here’s an example. Many of these authors are peers and industry thought leaders who share parallel platforms and mindsets, so it’s no surprise that their books start to sound a little similar too. Having said that, you could probably learn everything you need to know about “the three kings” of online marketing—search, social and content—in this one book. Optimize is an excellent investment, especially if you haven’t read other books with a similar approach. Social Media Examiner gives this book a 4-star rating.